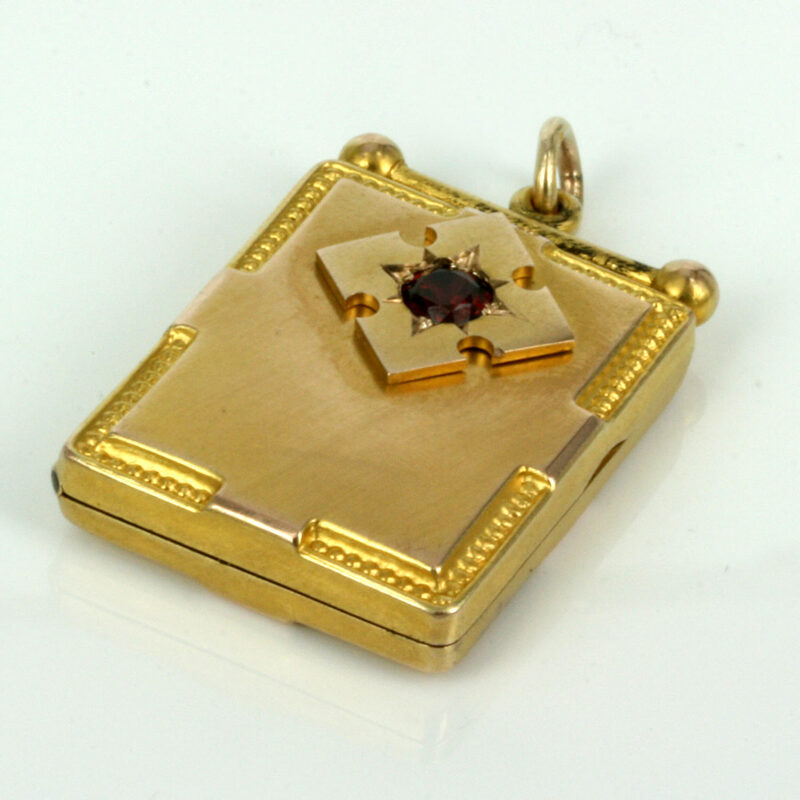 Antique rose gold locket set with a garnet. Product code: ES2803 Categories: Sold Items, Sold Jewellery. There is nothing quite like an antique locket around your neck with photos of your loved ones and this antique locket looks superb thanks to its shape and being set with a garnet. 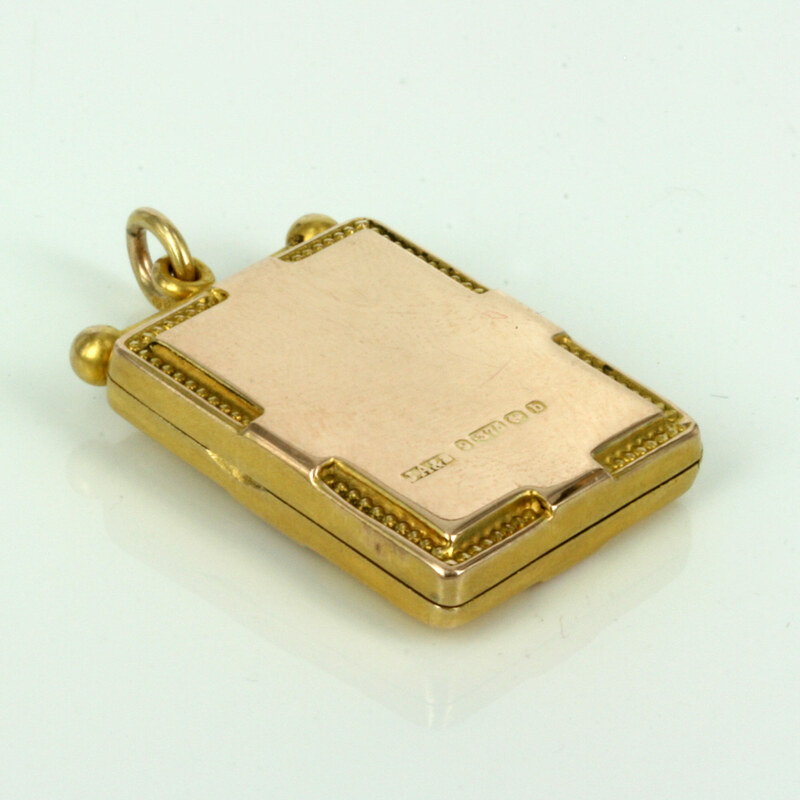 Made in 9ct gold, the locket was made in Birmingham in 1901 at the start of the Edwardian era and was made in such an elegant rectangle design. The locket measures 22mm across by 26.8mm high or 32mm to the very top. On each corner of the locket there is a further design that is so simple and stylish and typical of the elegance of the Edwardian era and jewellery that was produced during this time. On the front is a very attractive design set with a garnet that is a wonderful rich burgundy colour and really stands out against the gold. Inside there is room for two photos and the hinge is still in superb condition even well after 110 years later and opens and closes firmly. Antique photo lockets always seem to have that extra charm and character about them and that goes to help make them so personal and unique and treasured every time that they are worn and the antique lockets from years go by are just that bit more special for photos than so many of the modern massed produced ones today and all of this adds to the charm of owning and wearing an antique locket around your neck.